Contents: Is this all the local news? Is this all the local news? The spring 2019 issue of Index on Censorship magazine. 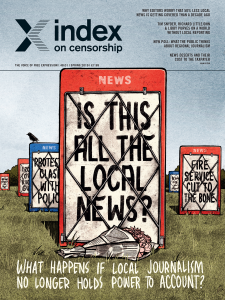 The spring 2019 edition of Index on Censorship looks at local news in the UK and around the world and what happens when local journalism no longer holds power to account. Special Report: Is this all the local news? The future is robotic by Mark Frary Would journalists have more time to investigate news stories if robots did the easy bits? News loses by Jan Fox Thousands of US communities have lost their daily papers. What is the cost to their area? Press freedom: EU blind spot? By Sally Gimson Many European countries are violating freedom of the press; why is the EU not taking it more seriously? In print, online, in your mailbox, on your iPad.